Shadow (F, Tux) and Oreo (M, B/W) have been staying with a short-term foster in Phillipsburg, NJ, who needs to transfer them because of the holidays. A new foster or home is urgently needed by this weekend. The siblings were found alone under a bush on Long Island, and have since had their kitten shots, have tested negative for FIV and FeLV, and have been dewormed. The bonded siblings are currently 12 weeks old and have very mild cerebellar hypoplasia. 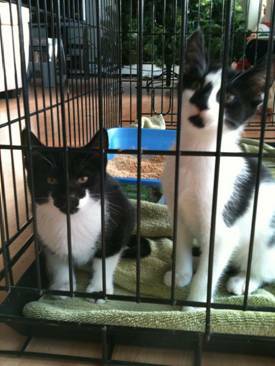 They’re very loving kittens who love to play, cuddle together and spend time with people. They’re also good with children. A full vet report is available for any potential foster or adopter; transportation to the foster/adopter is also available. This sweet girl was brought into a south Jersey shelter after someone reportedly saw her thrown against a wall. 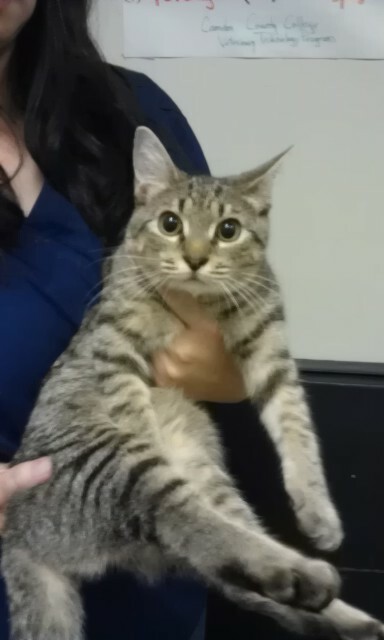 They thought her wobbles were due to trama, fortunately x-rays and a vet’s report reveal there are no fractures. Consequently, they’ve decided her wobbles must be due to a neurological condition, like cerebellar hypoplasia. She doesn’t need to find her forever home or be fostered by this weekend; however, if she’s really gone through some hard times, I think we can all agree she deserves a fantastic home as soon as possible. If you’re interested to foster or adopt this girl or the pair above — or if you just want more information, please contact me and I will send you the proper contact information. Thank you for your consideration!